You can only see your own Skill IQ, not other professionals who've taken Skill IQ, unless they decide to share it. You can share your Skill IQ on Stack Overflow, Twitter, and LinkedIn. As a learner on Pluralsight, you can share your Skill IQ on Stack Overflow. You can prove you know your stuff and show your skill level on your Stack Overflow Developer Story, which is designed to help you find employment opportunities and show off your skills. 1. I have a Pluralsight account and a Stack Overflow account with a dev story already. Log in to Pluralsight and Stack Overflow in different tabs. Then, simply go to your Pluralsight Profile page, click the Skill IQ you want to share, then click the Stack Overflow icon on your Skill Assessment page. This automatically shares your Skill IQ to your Dev Story. Add any tags, and click the save button. Note: You can't change tags or the assessment date after you click Save. If you need to change tags, go to the Gear icon in the top right and delete the Skill IQ, then re-add your Skill IQ to change any tags necessary. Your Skill IQ now shows on your Dev Story. 2. I have a Pluralsight account, but not a Stack Overflow account or Developer Story. Head over to StackOverflow.com, and create an account. Note: If you choose the email and password login option, you'll need to click the link in your email to activate your account. Then, click on Developer Story in the top left navigation. Fill out your Developer Story with the following details: your name; at least 2 skills you're interested in; location; your current employer, what technologies you use at your employer, and your responsibilities (75 characters). In the next dialogue box, add more skills you're interested in. This completes setting up your Developer Story. You must fill out all the information in the Developer Story dialog boxes to create your Developer Story. Then, scroll up to #1 on this page and continue sharing your Skill IQ. 3. I don't have a Pluralsight account. Click here to see subjects you can take a skill assessment in, to share on your Stack Overflow Developer Story. Create a Pluralsight account and start taking assessments. When you’ve got your Skill IQ, scroll up to #1 on this page to share your Skill IQ on Stack Overflow. Note: In order to share your Skill IQ on Twitter you must have a Twitter account. A pop-up dialogue box will ask for you to log in to your Twitter account and the Tweet of your score. Add in your login credentials and click Log in and Tweet. Note: In order to share your Skill IQ on LinkedIn you must have a LinkedIn account. Click on the LinkedIn icon. 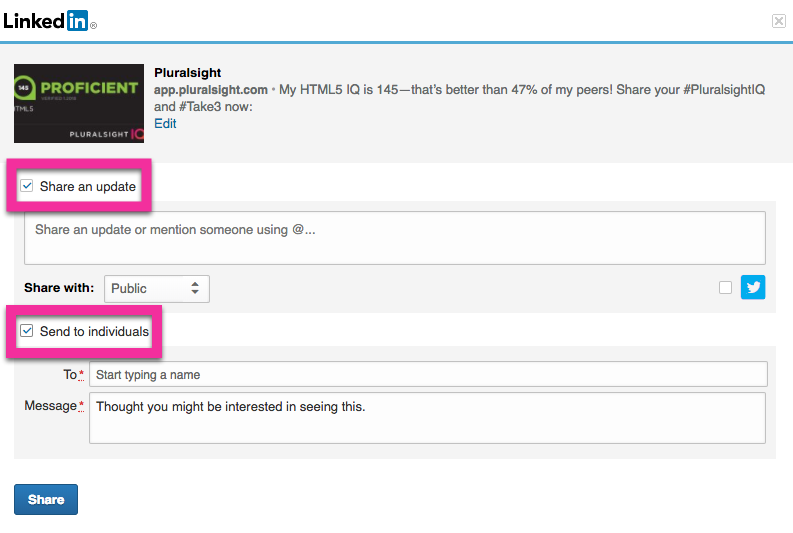 A popup dialogue box will ask for you to login to your LinkedIn account. Add your login credentials for LinkedIn and click Log In. You must check the Share and update box (this is shared to everyone) and/or Send to individuals box (shared to the individual(s) you wish).